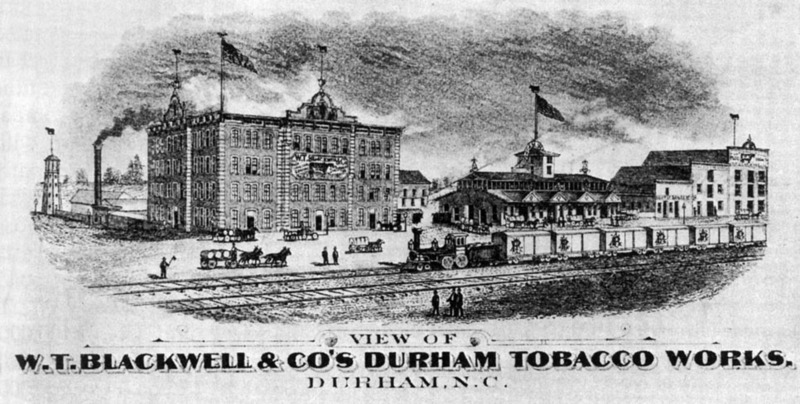 The Reams Warehouse was likely the location of the first tobacco auction in Durham in 1871. 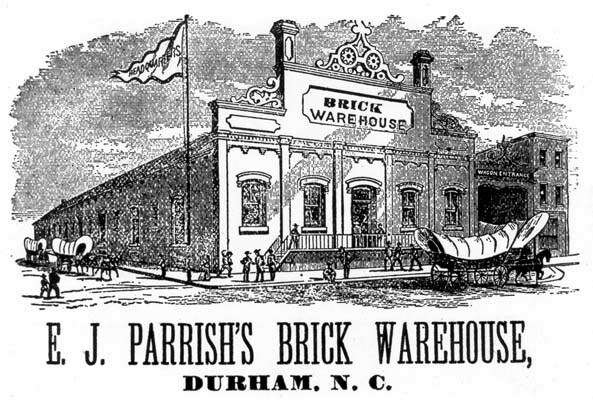 The 200 block of West Main St. was first the site of one of Durham's earliest major warehouses: The Banner 'Drive In' warehouse was built on the site during the 1880s. 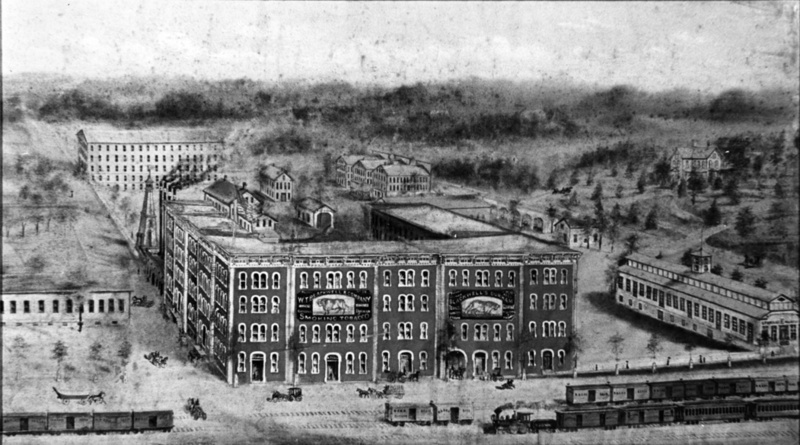 Banner Warehouse, ~1884, looking north from south of West Main Street. 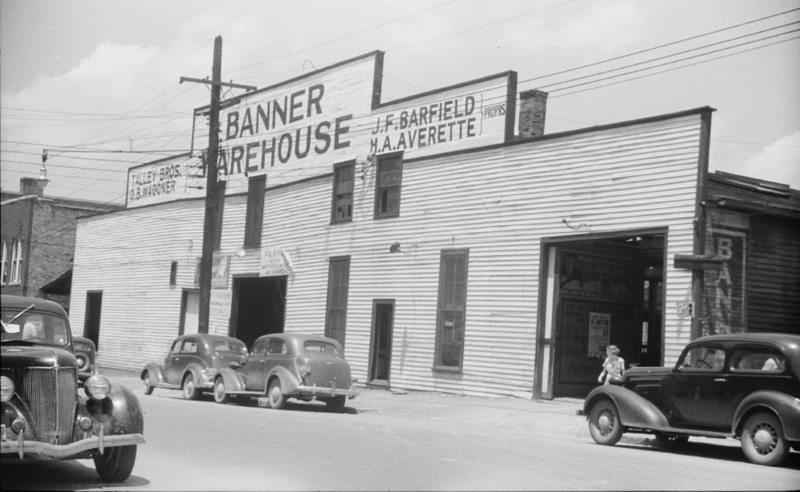 The Banner Warehouse later was enlarged under the management of Lea and Gattis. 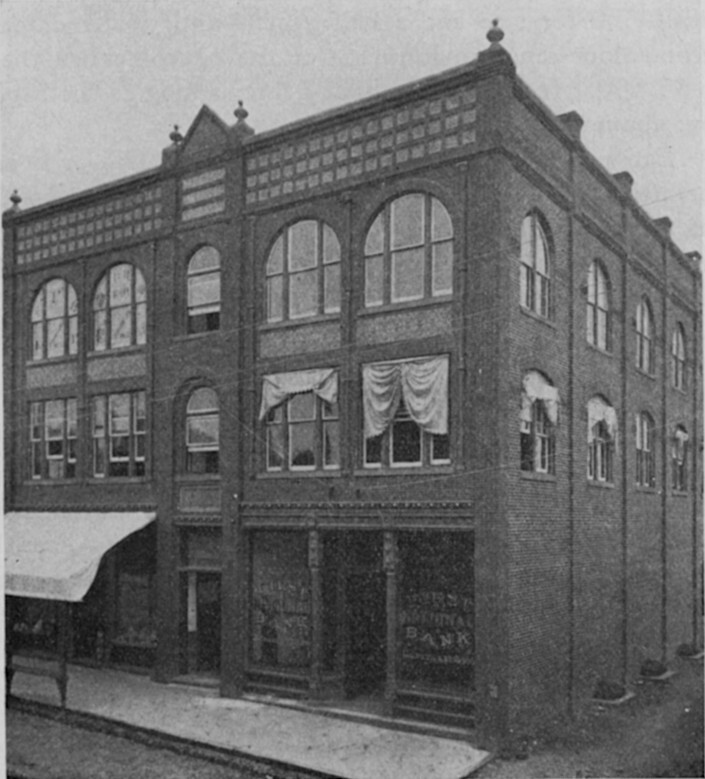 The Banner warehouse moved to another frame structure on Morgan St. around the turn of the century, and was replaced by the Trust Building. 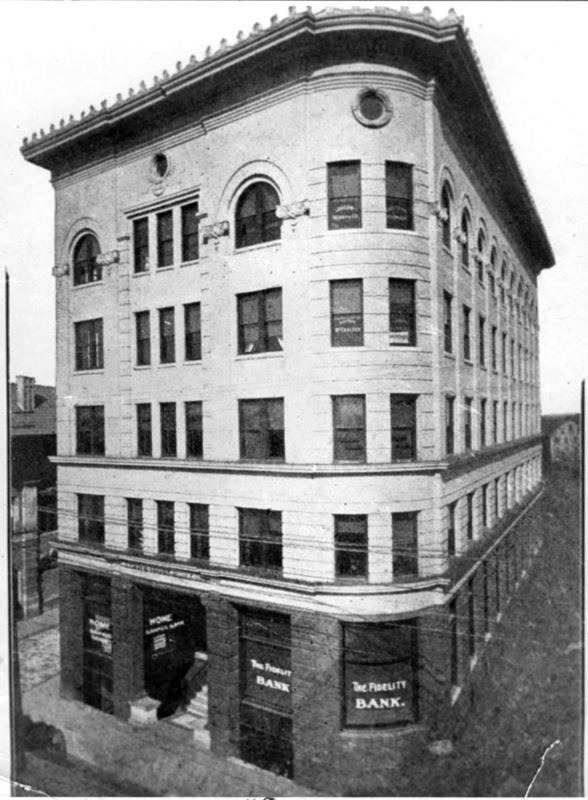 The Trust Building was Durham's first true 'office building of stature' - reportedly the tallest office building in the state at the time of its construction in 1905. Although one sources states that the Trust Building was designed by Hill C. Linthicum, a Durham architect, more definitive sources point to Hook and Sawyer, Charlotte architects who designed the Academy of Music, Southern Conservatory of Music, and Fire Station #2 in Durham. The building was constructed by Norman Underwood, and featured Durham's first elevator. The Trust Building, soon after construction. The major tenants for the building for many years were the Fidelity Bank, presided over by Benjamin Duke until his death in 1920, (his houses, 'The Terrace' and 'Four Acres' have been previously profiled) and the Home Savings Bank, established in 1904 by George W Watts, and John Sprunt Hill. The Fidelity was located to the right of the main entrance, the Home Savings Bank to the left. Multiple office tenants took space upstairs. 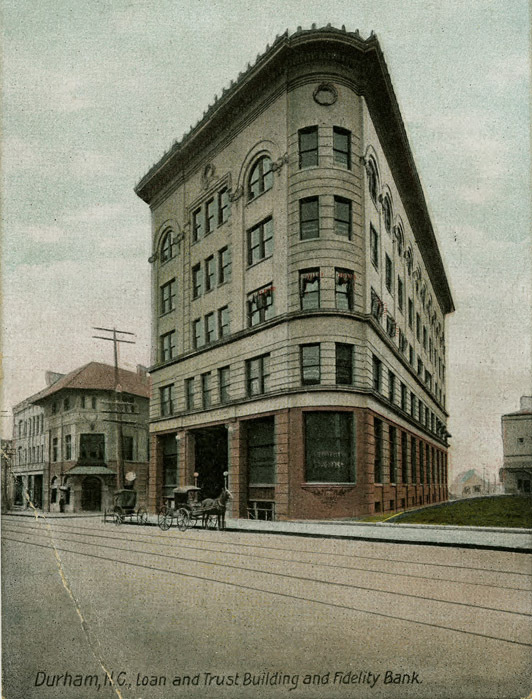 The Fidelity Bank moved to the Geer Building in 1915, and the Home Savings Bank later located on the former site of the Center Theater, at East Chapel Hill St. and Holland St. While the Trust Building stood alone amongst the surrounding 2 to 2 1/2 story structures initially, other impressive structures, such as the old post office, the First National Bank Building, and the Geer Building soon followed. 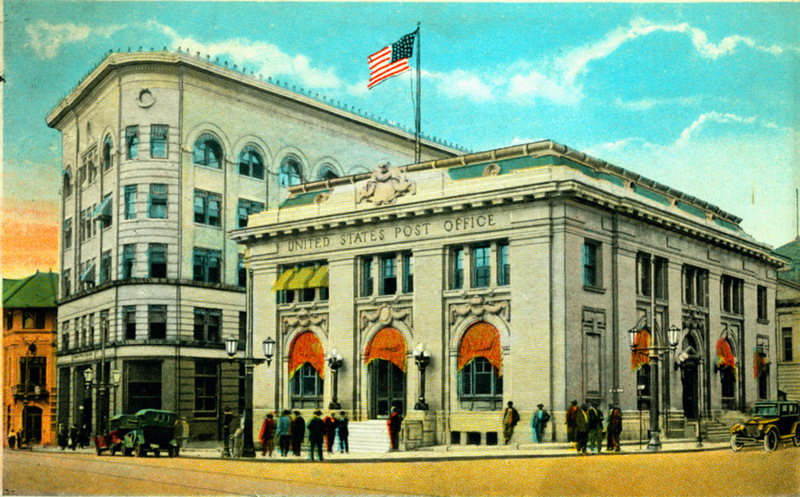 Above, the Trust Building, behind the old post office and south of the Academy of Music, early 1920s. Above, the Trust Building amongst its peers, late 1920s. Below, a view of the eastern facade of the Trust Building, taken from behind the old post office, looking west. In 1932, a sixteen foot deep addition was made to the north side of the building. Designed by Winston-Salem architects Northrup and O'Brien, the modernist/art deco styling of the addition was a stark contrast to the classical details of the original building. The construction of the Hill Building in 1937 unfortunately obscured the architecture of the Trust Building considerably, burying much of the eastern facade. The above picture would not be possible today. The ground floor of the Trust building was remodeled, apparently when the Hill building was erected, replacing the first floor glass storefront openings with masonry archways. In the 1960s, the bottom floor underwent further 'modernizing' that befell so many of the buildings downtown, as the quoins on the pilasters were filled in to create a smooth stuccoed surface. The Trust Building, below, mid-1970s. Fortunately, by the mid-to-late 1990s, the building was bought and renovated - the first floor was improved, although not restored to the original. I've always thought that the Hill building's intrusion on the 'prow' of the Trust building is rather obnoxious architecture. The western end of the 'short portion' of the Hill building could easily have been stepped back a few feet to allow a full view of the curve of the building from the east. It's usually pretty easy to tell when an architect or owner is/was disdainful of a particular building or architectural style; the choice to push the hard edge of the Hill building right up against the Trust building seems a clear display of ego to me. In 1879 EJ Parrish (the first man to auction tobacco in Durham) built a tobacco warehouse on the southeast corner of Mangum St. and the eponymous Parrish St.
No records exist of the exact location of the warehouse, but I do know that it was on the "western portion of the site", which would imply that the above view is from Mangum St. 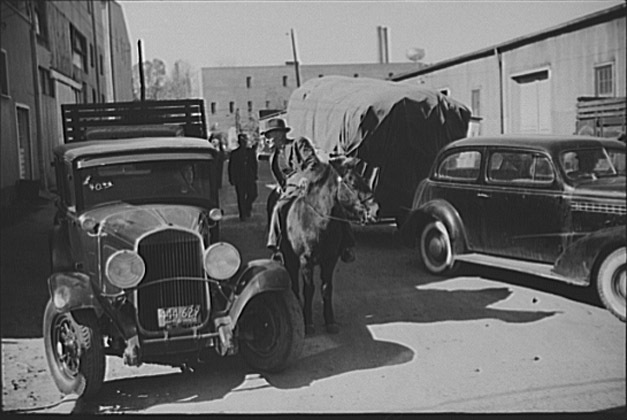 The Conestoga wagons were used to haul the tobacco to the warehouse for auction. By the 1880s, this warehouse had burned, and Parrish built a new warehouse on the north side of the street. 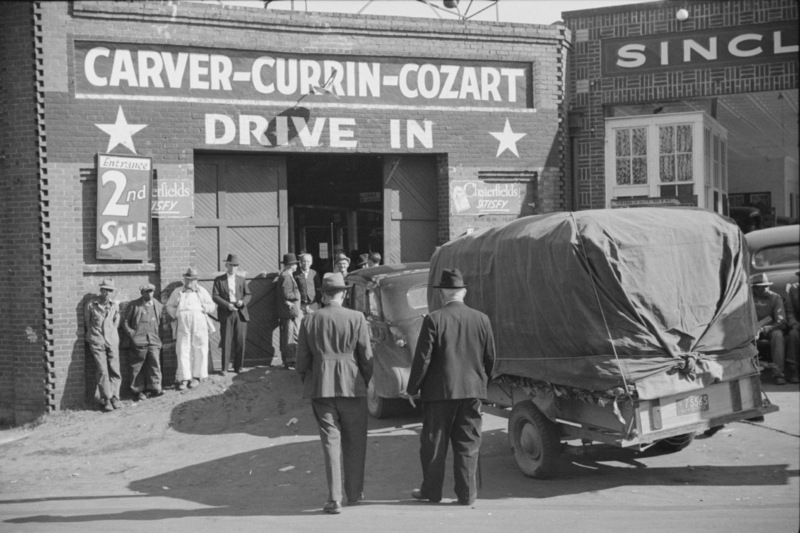 Julian Carr owned the site and constructed the 3-story Parrish Building soon thereafter. 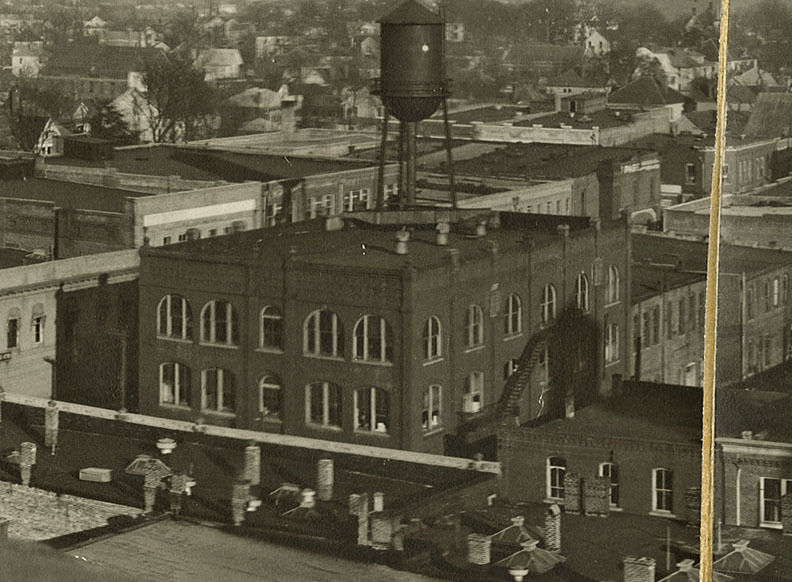 Above, the Parrish Building, ~1920s, looking northeast. 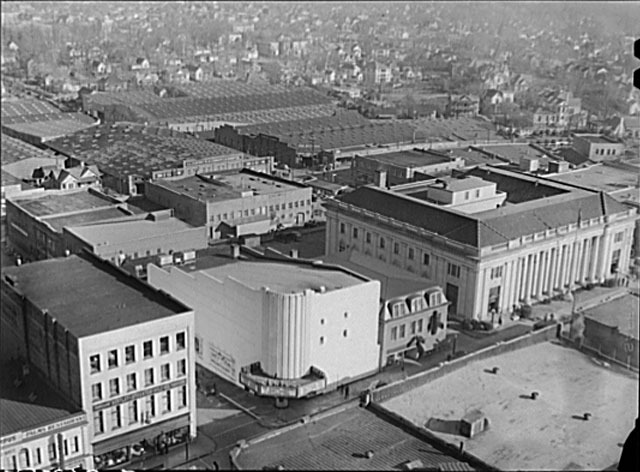 Multiple businesses used the building during the first part of the 20th century - the first offices of the Golden Belt Hosiery Company, the first location of First National Bank, and Durham's first movie theater - the Dreamland theater. 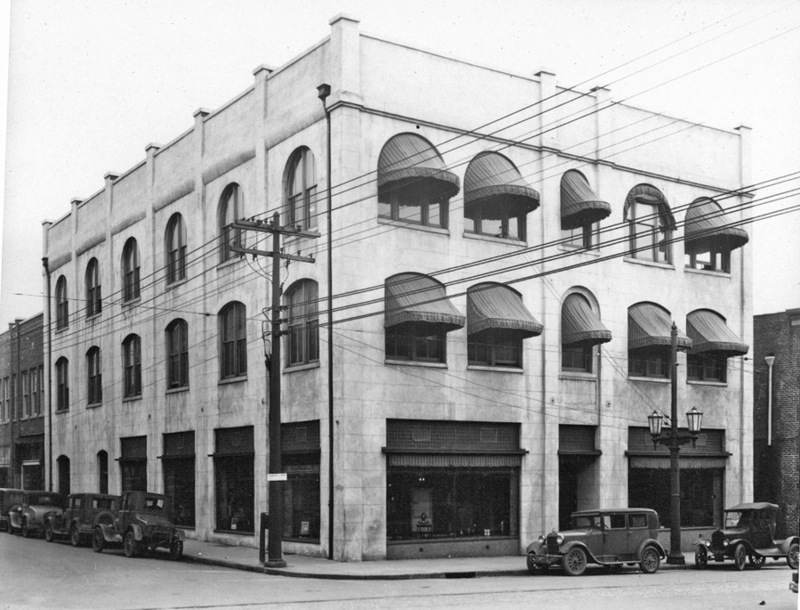 In 1918, the building became the headquarters of the Duke Power Company. Soon thereafter, the building was remodeled. It lost some of its late 19th century ornamentation and, it appears, received the stucco treatment. The Duke Power Company had quite the electrified Xmas display. I guess they sold appliances as well, from the looks of the window displays. I find the anti-window fetish of the 1950s-1960s truly bizarre, and this was the typical approach. I can only imagine that it was an attempt to save energy, but it seems sort of baffling to me. In 1972, Duke Power constructed the building just to the south of this site - I guess the bricked in windows still weren't modern enough. This building was torn down soon thereafter. 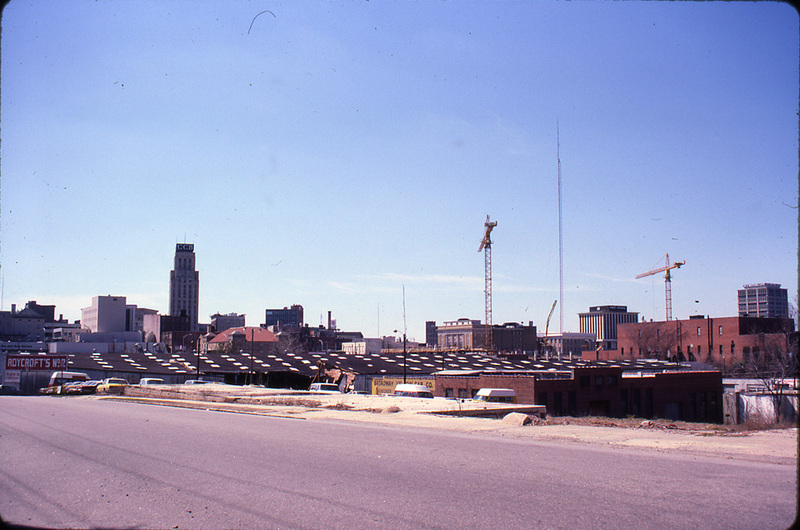 Looking southeast, 1972, after construction of the new Duke Power building. Oddly enough, it was replaced several years later with a somewhat similar building - which seems to echo some of the elements of the original building. I believe that it contains law offices. 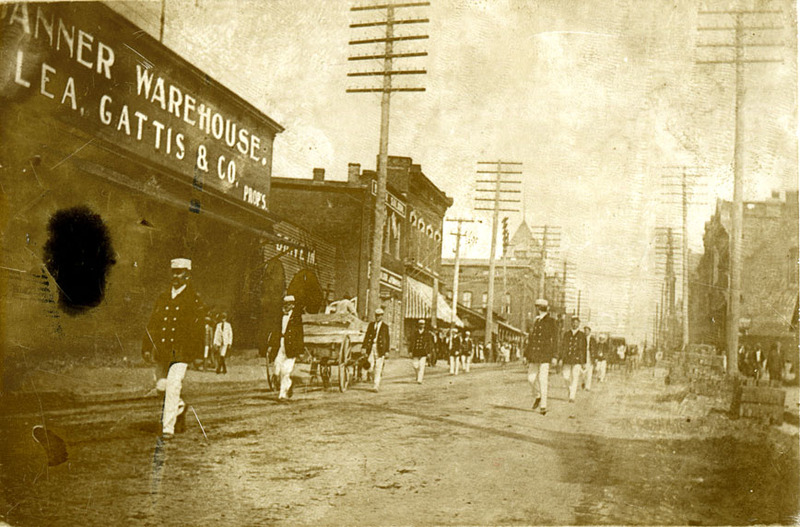 After his first warehouse on the south side of the 100 block of E. Parrish St. burned in the 1880s, EJ Parrish built a second warehouse that eventually extended most of the length of the block, although it was set back from Mangum St. with a grassy area in front and places to park your mule along the north side of the building. 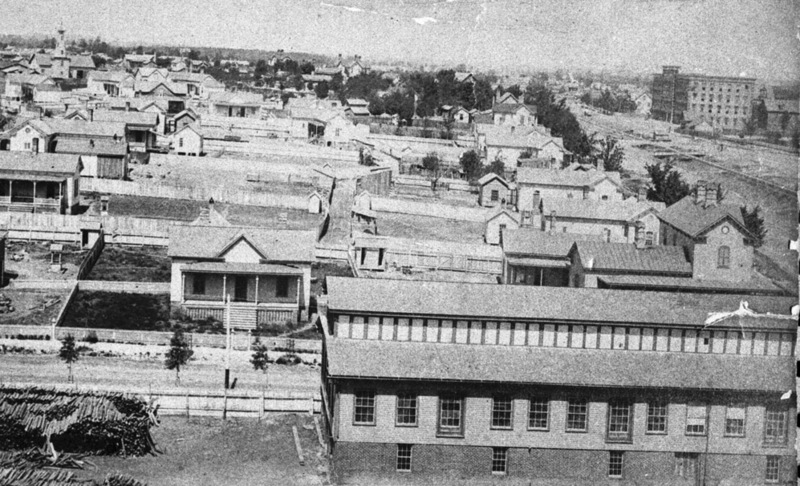 Above, the intersection of Parrish, Mangum, Orange, "Hollaway" (now City Hall Place), and North (later Rigsbee, now parking lot) - 1893. Fire Station #1 is located just to the north of the warehouse, and the Parrish building is just to the south. 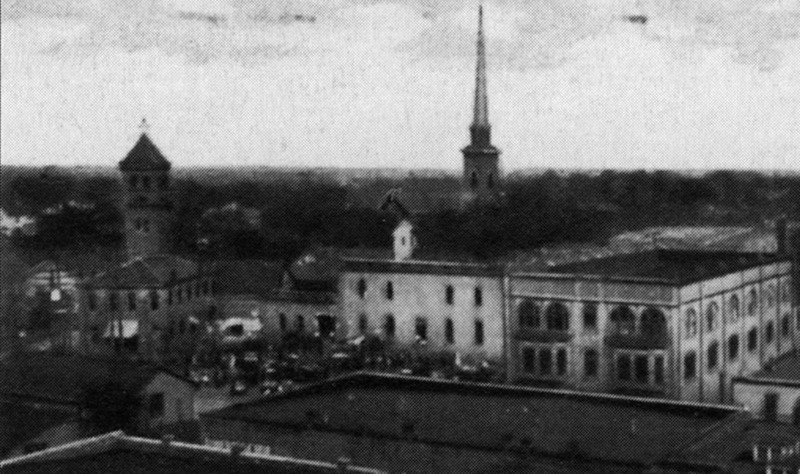 First Baptist Church is located west, across Mangum St.
Below, a fuzzy bird's eye view shows the EJ Parrish building (with some interesting protruding bays on the front that I hadn't previously noticed), the Parrish warehouse, and the first Fire Station #1. Trinity Methodist Church is in the background. By the January 1913, the Parrish warehouse was torn down by RH Wright. 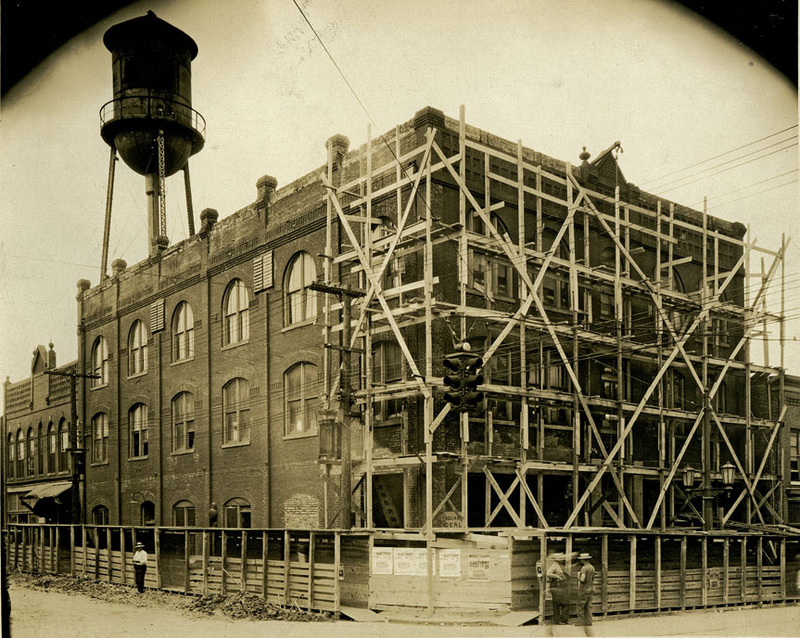 He announced that month he would tear down the ware house and begin construction on "six of the handsomest business buildings in the city - four [of which would] face Mangum street while the other two [would] face Parrish street" to be completed before 1914. Above, looking north from the 100 block of North Mangum St., around 1914. On the right, the EJ Parrish Building, and just beyond that, the northeast corner of Parrish and Mangum. There is a scale outside the front door, and it appears that there is a sign that says _Levin on the Mangum St. side. Public Hardware was an early tenant. 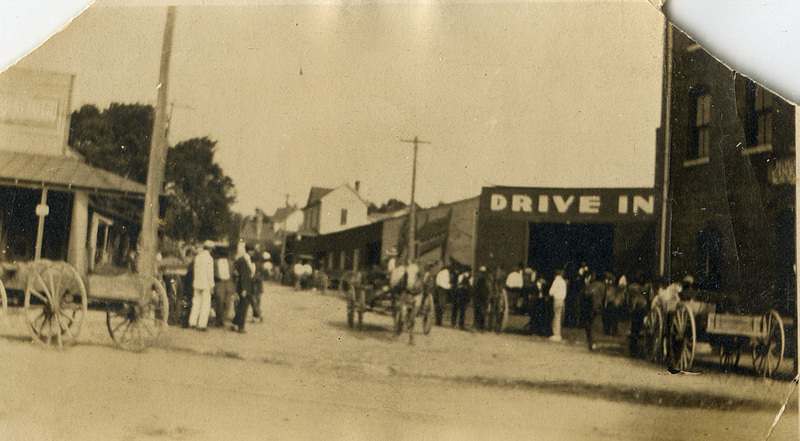 By 1923, they had moved a few doors east on Parrish St., and this building became the Rogers Drugs Co. Above, the view looking east-northeast, 1923. Moving left to right, a bit of the First Baptist Church is visible at the left edge of the picture, the first Fire Station #1, Rogers Drug, and the EJ Parrish building. ( I surmise 1923 because Trinity Methodist Church is missing in this picture - it burned in January 1923 and was rebuilt in 1924). The Rogers Drugs Co. was the longstanding occupant of this building during the 20th century, A small view of their sign is visible at the left edge of the shot below, looking east on Parrish St. ~1940. A shot of the south side of the building looking west down Parrish St., 1950s. The business lasted into the late 1960s. Above, the Rogers Drugs Co., 1968 - note the multiple building entrances/storefronts. A 1970s redo deprived the building of its original windows and much of its variety of entrances on the first floor for a feast of plate glass, but helped meet the wig needs of Durham. Another redo in 1980 reformulated the entryways with arches and different doors. Greenfire appears to have nearly completed renovations on the old Rogers' drugstore, and has "For Lease" signs up. They've done a marvelous job with the exterior, returning to the original form windows, which elicits a sigh of relief after looking at this structure with terrible solid 1980s tinted windows for decades. 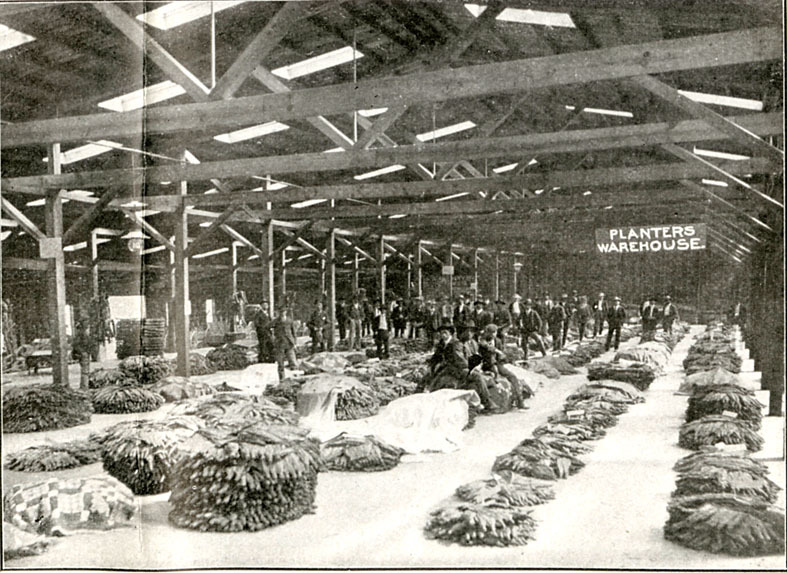 The interior of the Planters Warehouse, 1905. 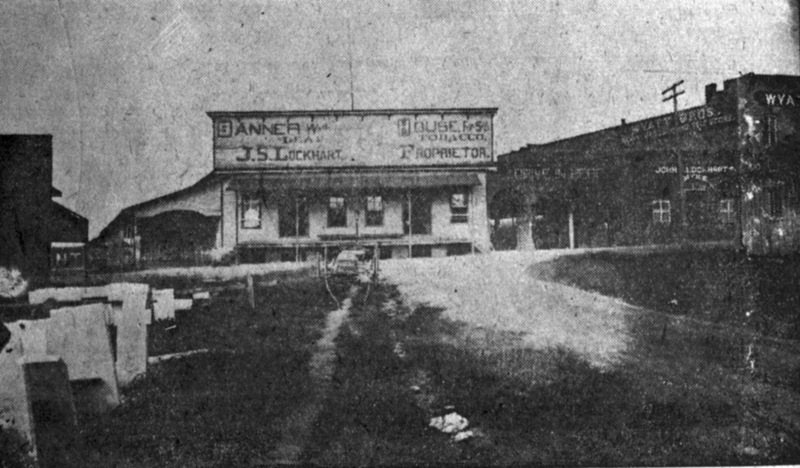 Probable view of the Planters Warehouse - looking east from Mangum St., 1905. The above picture does not resemble the version in 1920s and later photographs, but is labelled as the view east on East Chapel Hill St. from Mangum St. The warehouse may have been remodeled in the early 20th century. The windows on the building at the right extreme do match the building that was adjacent to the warehouse. 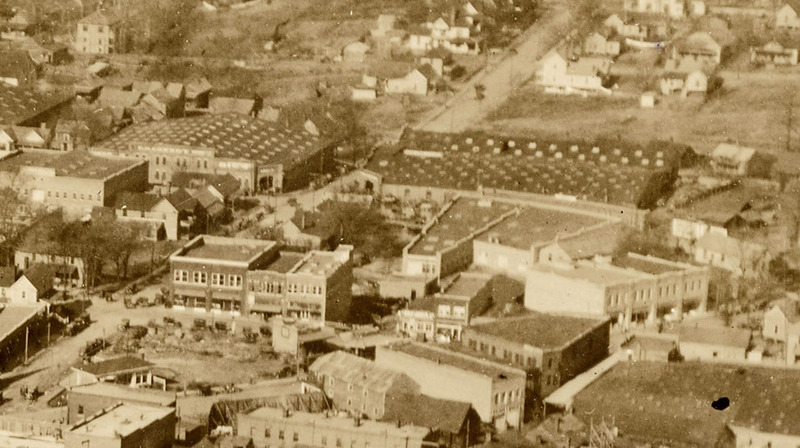 As the central area of downtown grew (in large part due to all of that tobacco money) many of the early warehouses, such as the Reams and Parrish, were torn down to make way for other commercial buildings. The next generation of warehouses grew along Rigsbee Avenue, near the Banner Warehouse. The Planters warehouse remained, however - a bit closer to the heart of downtown than the district north of Morgan. 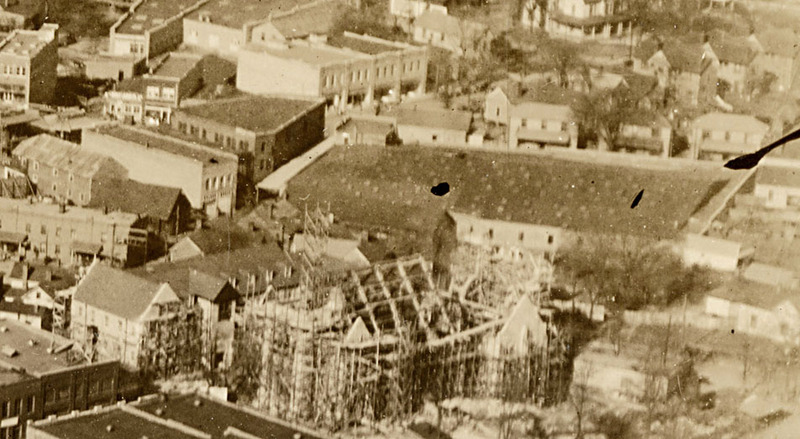 The Planters warehouse roof, looking northwest (the current sanctuary of Trinity Methodist is under construction) 1924. Looking east-southeast down East Chapel Hill St. from North Mangum. ~1960. Looking south, from N. Mangum, 1961. In 1962, the Planters warehouse burned to the ground. Looking northeast from the site, with the Fuller School and First Baptist Church in the background. After the city bulldozed the buildings at the southeast corner of North Mangum and East Chapel Hill, the remainder of the site became surface parking. Some of the land formerly occupied by the Planters warehouse was taken over by a new roadway connecting Holloway St. with East Chapel Hill St. - a roadway that was a precursor to the Loop. You can see the McGhee Furniture building at the southeast corner of N Mangum and East Chapel Hill is still standing in the above picture. Soon thereafter, the remainder of the buildings on this side of the block were demolished. Looking west towards the remainder of downtown. Above, the new roadway, dividing the block. The eastern portion of the block would become the new fire station #1. The western portion would become a new police station. Nearly complete, looking north-northeast, 1965. A grainy but fascinating aerial shot, 1972, showing the halfway-done urban renewal on the east side, the pre-loop new connector between Holloway and East Chapel Hill, and the police station. Looking southwest from East Chapel Hill, 1978. The police station is currently City Hall Annex, silently rebuking East Chapel Hill St. Although our new ubiquitous 'wayfinding' (to use the earnest planning lingo) signs proclaim the area of the Liggett redevelopment as the "Warehouse District", the real warehouse district in Durham stretched along both sides of Rigsbee Ave., north of Morgan St. The view in 1924, looking northwest. The two very large brick warehouses straddle Rigsbee - the Big 4 Warehouse on the left and the Star Brick Warehouse on the right. These were the warehouses where the real commerce of the tobacco industry took place - hundreds of farmers coming to market and buyers purchasing the tobacco at auction. Looking northeast from the Washington Duke Hotel, 1940 - East Chapel Hill St. is in the foreground. 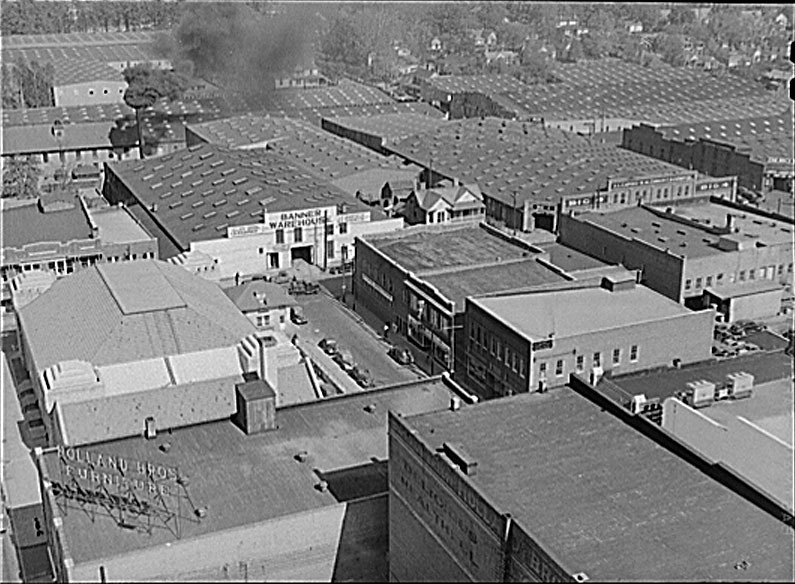 Tobacco warehouses cover the landscape north of Morgan St.
Below, the entrance of the Star Brick Warehouse - looking northeast from Morgan and Rigsbee, 1940. 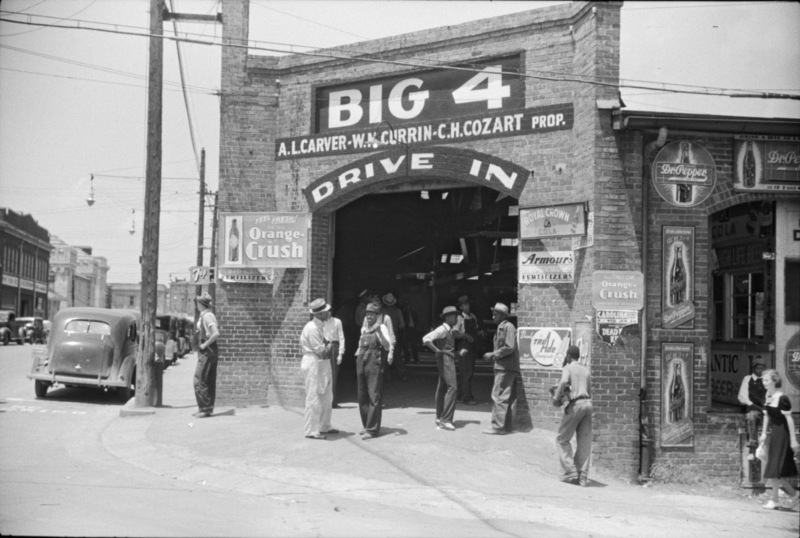 In 1944, the Big 4 warehouse burned in a protest over the acquittal of the murderer of Private Booker T. Spicely. The Star Brick warehouse survived the fire. Below, another view northeast, 1960. The warehouses - with the exception of the Liberty - were torn down during the 1960s-1980s - not by urban renewal, but just by changes in the marketplace. From the Surgeon's General Warning in 1964 onward, the health consequences of tobacco became clear, and its fortune (and that of those who dealt in it) faded. Never fear, though - we southerners don't give up a slow death that easily. Looking northwest from Rigsbee Ave. and Morgan. Looking west up Morgan from near Rigsbee Ave. Looking south-southwest - the Big 4 warehouse is to the right. According to newspaper accounts, around 9pm on July 8, 1944 a fire started in the the basement of the Big Four warehouse, where furniture was being stored. In less than three houses all but one building remained in the block - 0,000 in downtown property was destroyed. According to Charlotte Observer, July 9, 1944, "Other establishments burned to earth included the Central leaf redrying plant and the Dillard livery stables, where 12 cows and four horses burned to death." Both Tim Tyson and Christina Greene have postulated that the fire resulted from protests on the night of the murder of Booker T. Spicely - he was shot and killed by bus driver Herman Council earlier that day. There is no mention in the newspapers - either Charlotte or Durham - of soldiers called from Butner that night, protests, violence, etc - even though they report on the murder of Spicely as well. It's doubtful that such a riot would have occurred the night of the murder - rather that upon Council's acquittal several months later. It's particularly dubious that a race riot, mobilization of Butner soliders, etc. would occur with no mention in the papers. Unfortunately, the Carolina Times from that era is lost. Greene does not source her statements; I don't own Tyson's book to check his source for the assertion. Sometime during the 1950s, two car related businesses, Midtown Motors and Goodyear, opened on the site. 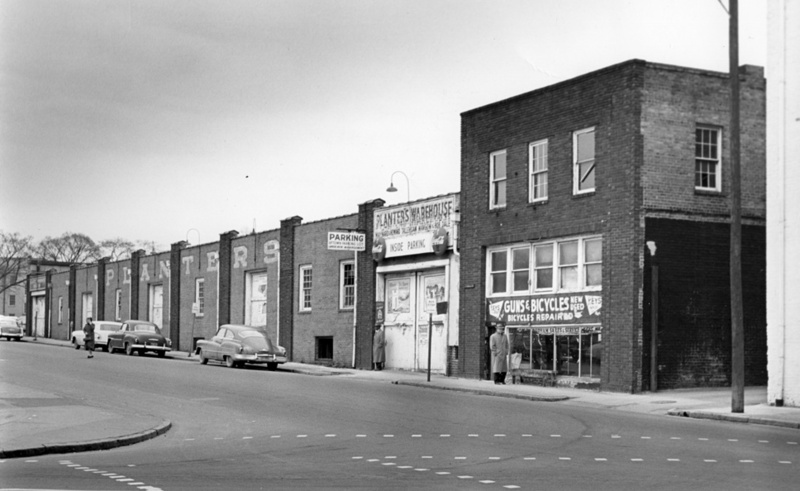 The original Liberty Warehouse was located at the northeast corner of Rigsbee Avenue and Seminary St. The warehouse was constructed in the early 1930s, and operated by Satterfield and Stone. Looking north up Rigsbee Ave. from Seminary St., 1940. The Roycroft warehouse is on the left. 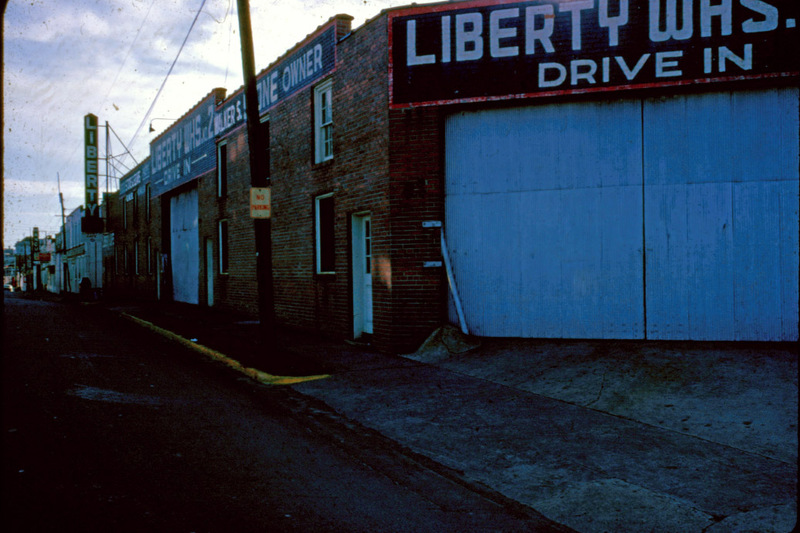 The original Liberty Cafe was part of this warehouse as well, opening out onto Rigsbee Ave. Looking north on Rigsbee Ave. from near Morgan - the Liberty Warehouse is to the right. After construction of the newer Liberty Warehouse at Corporation St. and Rigsbee Ave., the former Liberty became part of the expansion of the Currin and Cozart Star Warehouse. 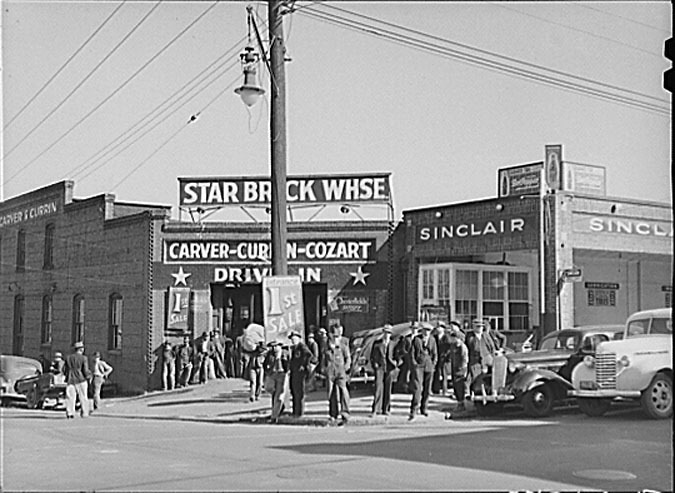 The original Star Brick Warehouse was located in the block immediately to the south. Originally the No. 2 warehouse, by the 1960s, this building had become the No. 1 and No. 2 warehouses. Although it appears that the warehouse was defunct by the 1970s, the building was still in existence in 1987. Looking west down Seminary St., 1987 - the Star warehouse is on the right. This next-to-last tobacco auction warehouse was torn down in 1999. Utilizing 2001 bond funding, the county constructed a .5 million "Center for Senior Life" on the former site of the warehouse, which opened in 2006. Soon after it opened, people decried its low utilization. Part of this may have been attributable to difficulty completing construction of areas such as the center kitchen. I've heard little about the center since then; from outward appearances, I see little activity. The architecture of the center is adequate - although it's set way too far back from the street in my opinion, with a large lawn of questionable utility in front. At the very least, they avoided the seemingly insatiable urge to stick parking in front of the building, and it is oriented towards the street. 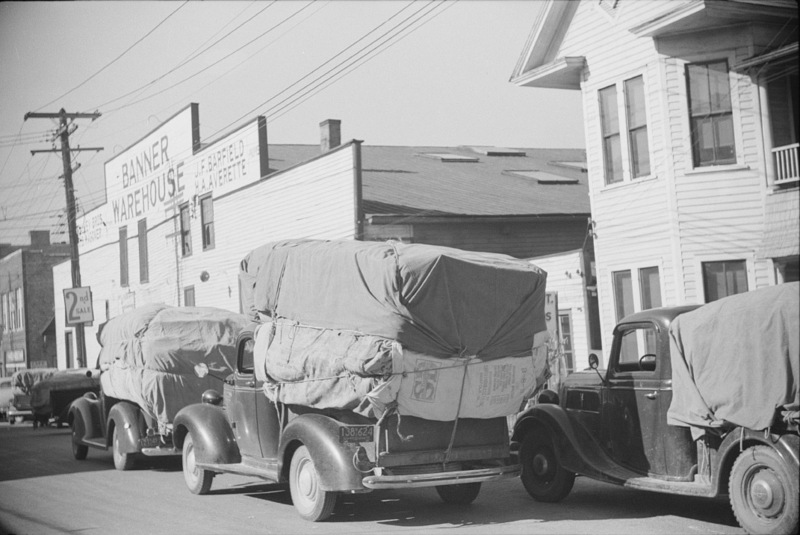 Sale day, 1940. Looking northwest from Rigsbee Ave. and Seminary St. 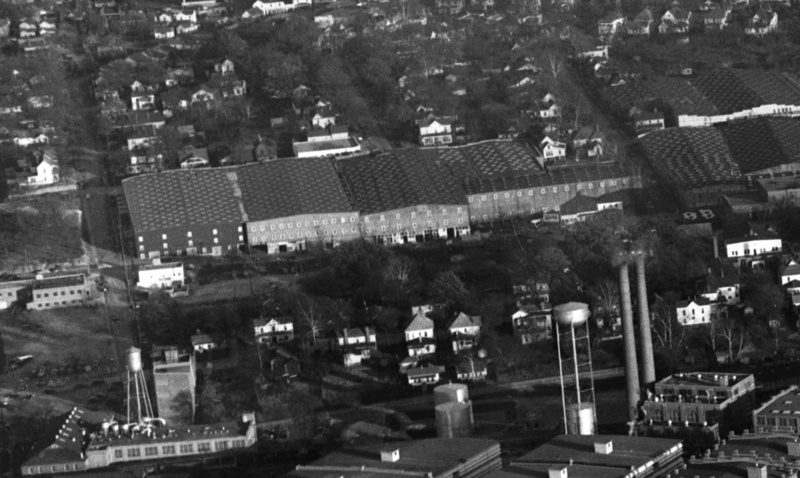 The Roycroft Warehouse was one of a series of extremely large warehouses that covered the area north/northeast of downtown Durham. I've previously covered several of the major warehouses, including the Big 4 and Banner Warehouses, destroyed in the conflagration following the acquittal of Private Booker Spicely's murderer, as well as the Star Brick Warehouse and Planters Warehouse. These warehouses were a second and third generation of sales warehouses,having supplanted Parrish's Warehouse, the Globe Warehouse, the Reams warehouse, and others. These warehouses were the site of the tobacco auctions - where farmers would come to market and sell their tobacco - as such, the auctions were seasonal events - predictable and yet exciting. 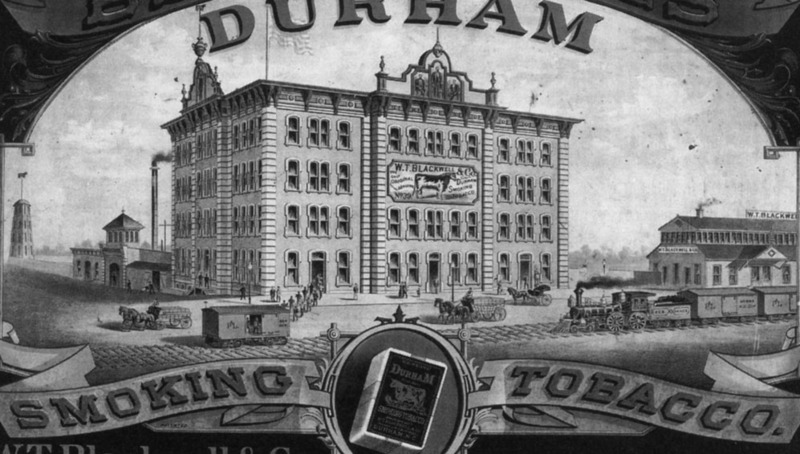 The first tobacco auction in Durham was held on May 18, 1871 in the Reams Warehouse, which stood on the present-day American Tobacco Campus. The auction allowed farmers to sell to multiple factories and factories to buy from multiple farmers - at the same time. I very much recommend this brief video clip on YouTube from a documentary about tobacco auctioneers. I believe I first saw this linked on Whig Hill. 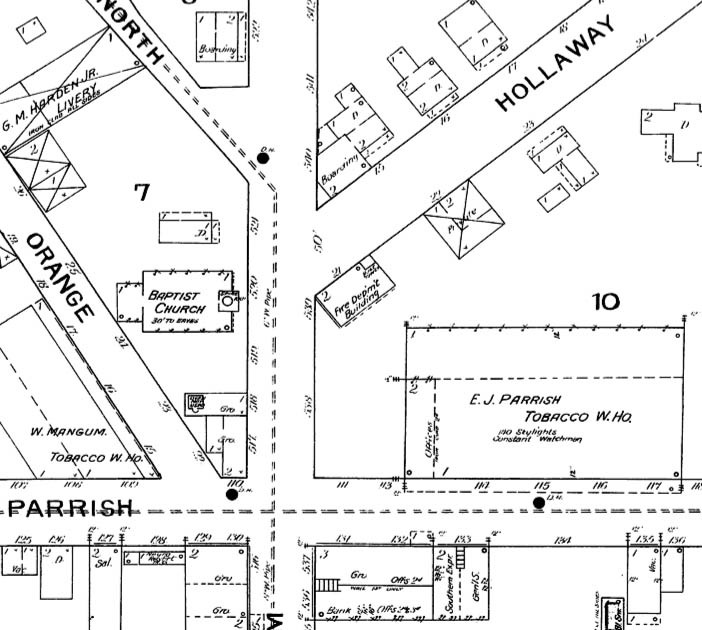 The Roycroft No.1 and No.2 covered the entire large block between Foster St., Seminary St., Rigsbee Ave., and Hunt St. In 1951, the Roycroft was noted to be the "oldest tobacco warehouse to be operated continuously by the same family." 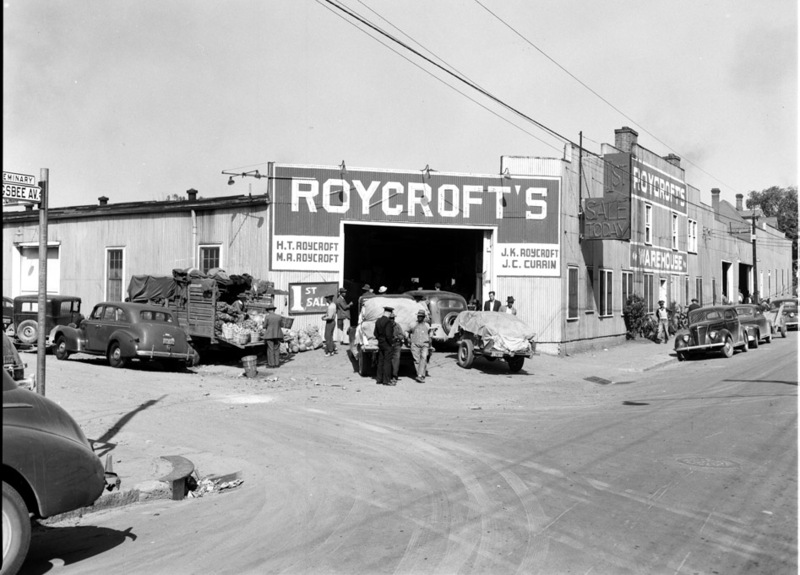 Henry Roycroft started in tobacco sales in 1895 in Rocky Mount, operating a tobacco during the same period. He came to Durham in 1910, still engaged in both 'warehousing' and farming. In 1928, he went into business for himself under the Roycroft name along with his son Marvin Roycroft. 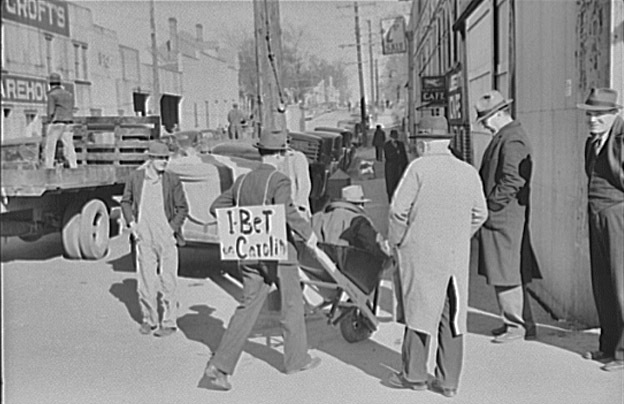 Sale day, 1940 - looking west on Seminary St.
Sale day, 1940, looking north-northwest on Rigbsee Ave. from near Seminary St. Evidently the man wearing the sign lost a Duke-Carolina bet and is wheeling the Duke fan around in a wheelbarrow. 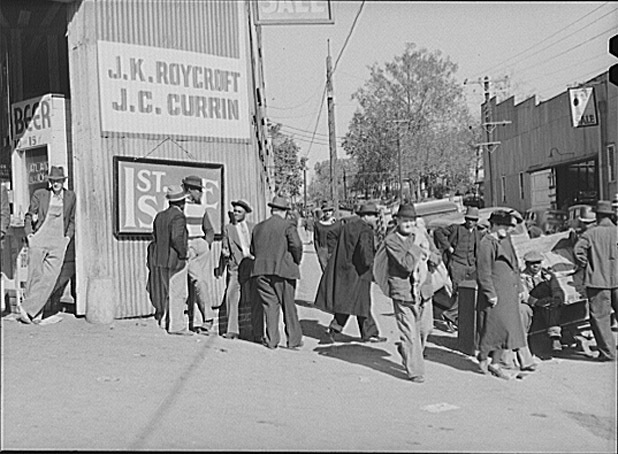 Sale day, 1940. Looking north-northeast from Rigsbee Ave. and Seminary St. Looking west-northwest down Seminary St. towards the Roycroft Warehouse, 1940s. 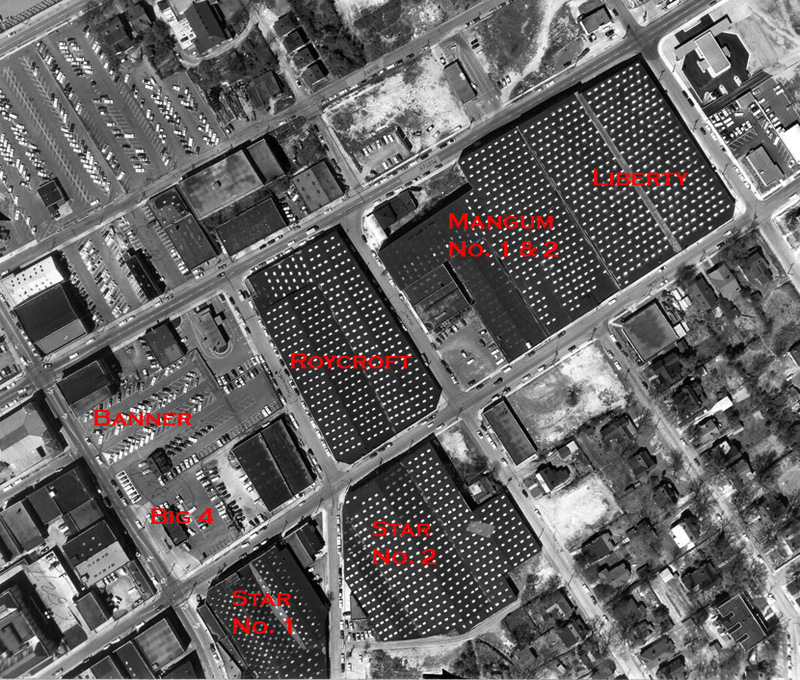 Annotated aerial of the warehouse district, 1959. I've also marked the location of the Banner and Big 4 warehouses, which burned in 1944. Blurry shot of the No. 2 entrance to the Roycroft, looking south-southwest on Rigsbee Ave.
By the 1960s, tobacco and the auctions were on the decline. Both the general decrease in the demand for tobacco and an ongoing shift from auction sales to direct sales (from farmer to manufacturer) meant a slow ebb of the seasonal tobacco auctions. I've been trying to nail down the date when tobacco auctions ceased in Durham - the only date I've found, associated with the Liberty Warehouse, is 1984. The Roycroft warehouse was still in existence in 1987. But it was purchased and demolished for parking when the Blue Monster, i.e. the Durham Center was constructed in 1987. Looking southwest at the Roycroft being torn down, 1987. It remains an immense surface parking lot, which last year served as the Centerfest tarmac. I'm certainly of the opinion that the brouhaha around this Central Park area will never amount to too much while this much open asphalt is still at the center of the landscape. Looking west down Seminary St., 07.06.08. More broadly, and this is a recurring theme as I examine the tobacco warehouses, it seems a shame that such a vibrant part of Durham's cultural vitality has been consigned to the bin of shame with the Folium Non Grata. 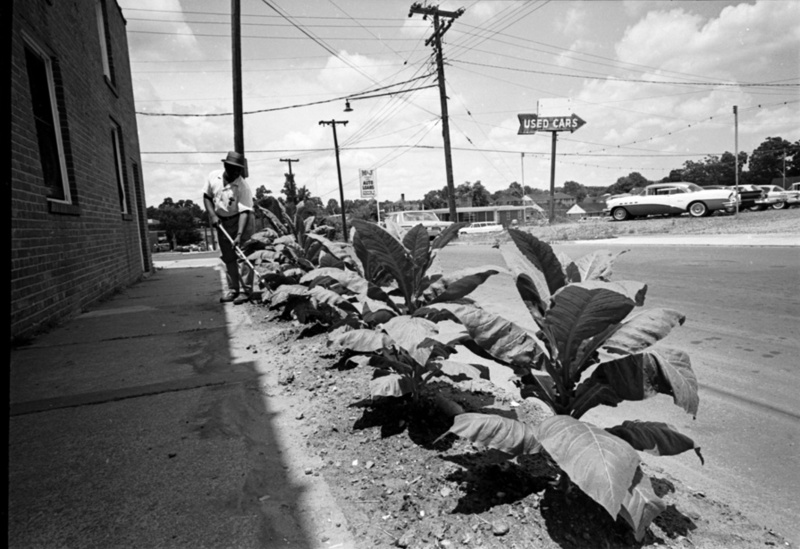 We should be able to celebrate the cultural history of a community that followed the rhythm of the tobacco harvest without worrying that such celebration is unseemly because of the personal and public health toll of tobacco use. The collapsing of the chronology of tobacco, casting a negative light over the lives and joy of generations of people who lived in the early to mid-20th century is rather unfair. We should hope to be luckier than to have our joys and culture caught in a reductionist swath of righteous indignation that subsequent generations will undoubtedly heap upon ours. It takes nothing away from the myriad public health campaigns, policy measures, personal appeals, educational programs, etc. to find beauty in the cadence of the auctioneer's voice or humor in the pictures of the lost bet on a Duke-Carolina game, above - pictures entirely of people who bought and sold tobacco for their livelihood. The Duke Homestead certainly does a fine job preserving these aspects of Durham culture, and I believe that they have an annual festival (including a mock auction). I've never been, but it looks like it's September 6 this year. Moving forward, I hope we can find ways to integrate this historical context into more central-Durham events. I'm not suggesting that we restart the yearly Tobacco Jubilee and Parade, but tobacco was, after all, Durham's raison d'etre. I doubt very much that anything we love about Durham would be in Durham without it. 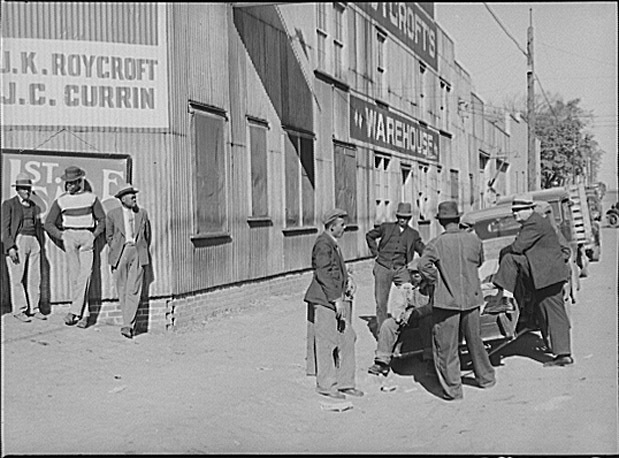 Mangum Warehouse, looking west from Broadway St., 1940. 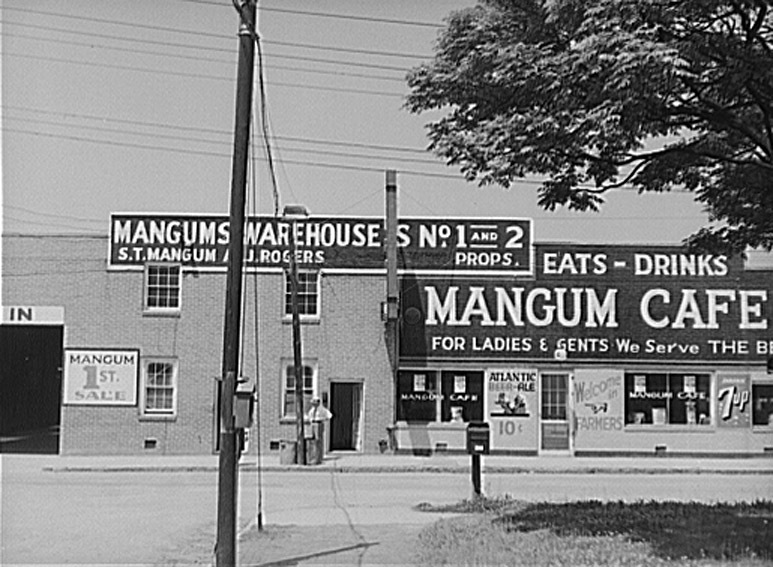 The Mangum Warehouses (No.1 and No.2) were built between 1937 and 1940 on sloping terrain to the north of the earlier tobacco warehouses. 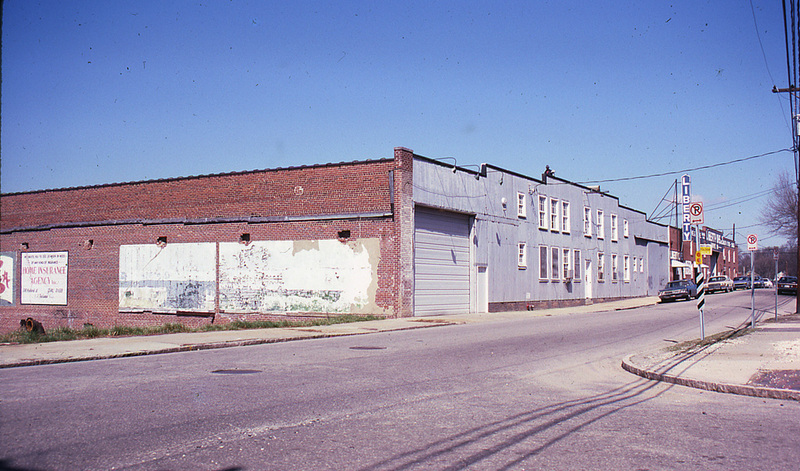 The Rigsbee Ave. frontage was, prior to construction of the warehouse, residential. 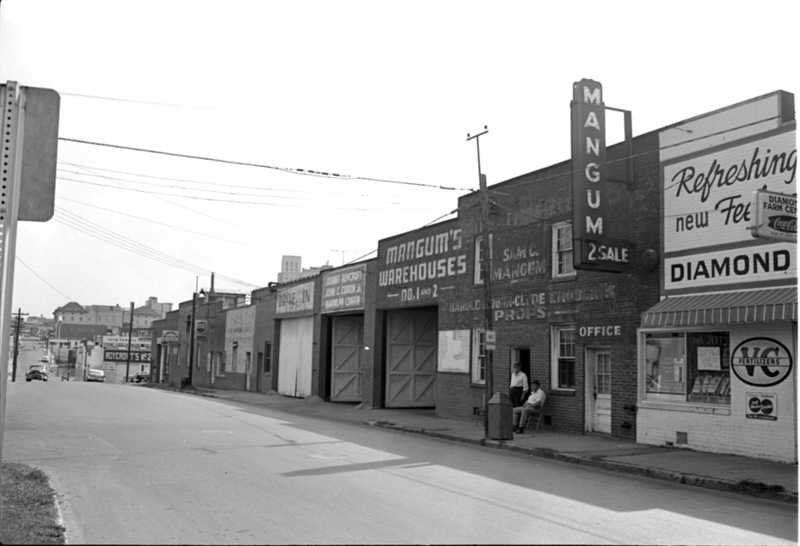 Like the Liberty, the Mangum initially included a cafe, although by the 1960s, this had given way to one of several farmers' supply stores in the warehouse area. 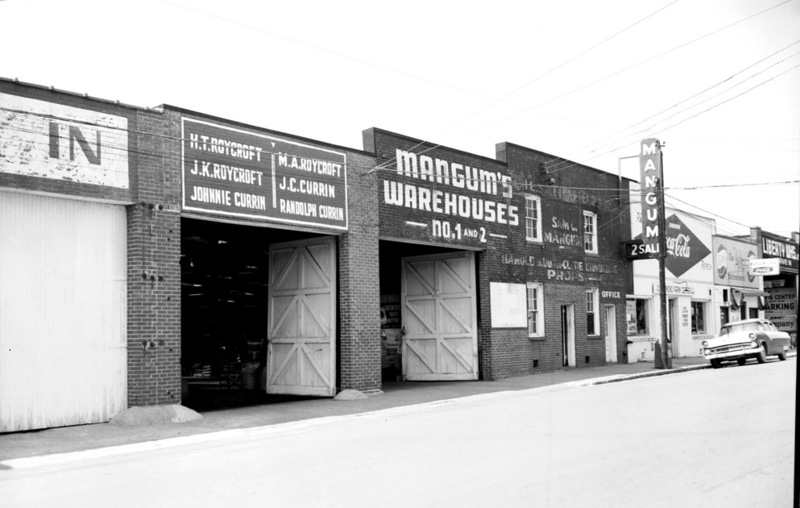 The Mangum Warehouse had been torn down by the mid-1980s. The land remained empty for ~20 years. By the mid-1990s, several volunteers had begun to conceive of the concept of Durham Central Park, which would utilize the former site of the Mangum Warehouse, as well as vacant land to the west of Foster St. to create an urban park. From a perusal of their master plan, it appears that there is significant work yet to be done on the former Mangum site, particularly near Rigsbee Ave. It presents a pleasant lawn at this point with the bridge and open portion of the creek at the lower end of the slope as a distinctive feature. I personally keep hoping for some piece of additional definition that will help make it feel more park-ish to me, but the urban green is a nice addition to downtown. Former Mangum Warehouse site, looking northwest from Rigsbee Ave., 06.07.08. Former Mangum Warehouse Site / Central Park lawn and pavilion, looking northwest, 06.08.08. Hard to completely understand, looking at this grade, how the warehouse might have been configured on the interior. We're moving out of that arena now, and there's a big question whether we will be victims of our own success. The success of the renovation projects has attracted people and businesses, and that has attracted developers who are less creative. They know how to make money, but that doesn't mean that they are going to build good stuff. For the most part, the bland apartment complexes being built in a 2014 frenzy have been placed on parking lots and underutilized land, so it's, at worst, no harm, no foul. At least they are urban in their massing, even if the construction is cheap and cheap looking. The second (third?) generation of Durham redevelopers didn't fall in love with the gritty down-on-its-luck city with the beautifully decaying buildings; they fell in love with millenials paying for some dumplings at a food truck.